One of the biggest investments we've chosen to make for Shroomie is attending Hypnobirthing classes. I can't be in the minority when I say that I have always felt phobic about the concept of childbirth - the way it is viewed within society and portrayed in film and media can be very negative and scary. Hypnobirthing appealed to me as a concept long before I actually became pregnant, as I had heard accounts of women who had previously experienced traumatic births that went on to have a very different experience with Hypnobirthing. It's not as wacky as it sounds, either, despite the "Hypno" title - as our teacher reassured us, much of it is common sense. The idea is to relax the body as much as possible in order to increase endorphins and reduce adrenaline - and it makes perfect sense that the body will not easily give birth if it is tense and fearful. I am already so pleased we've made the decision to use this method mostly because I no longer am terrified at the idea of giving birth - which is in itself priceless. Though it is probably the most intense experience my body will ever have, this mindset has convinced me that my body is designed for, and capable of, birthing a baby. I've been supporting the concepts of the Hypnobirthing class with meditation and affirmations. I've been trying out some printed birth affirmations from I Can Do This Studio on Etsy to be used as pretty visual reminders of the concepts, as well as listening to Hypnobirthing relaxations and affirmations in order to train my body to learn to fully relax. I've also rediscovered Headspace which is brilliant for all kinds of meditation but am currently completing a course on pregnancy - and as sleep becomes more elusive, there are many features of the app which can help with that too! I also treated myself to a candle from Holly Cassell who has been making the most beautiful hand poured, soy wax candles gently scented with essential oils and containing crystals. I opted for Aphrodite, themed for feeling joy, feeling lovely in the body, opening the heart and calming. The fragrance is a rose and lemon blend that Holly ensured contained only essential oils that were safe during pregnancy and specifically chose the crystals that might be most beneficial, such as moonstone. The scent is noticeable but not at all overbearing which is great with my super-scent right now, and I've been using it a lot during meditation, relaxation and yoga as part of a self-care ritual. -The Kind Mama by Alicia Silverstone has fast become my favourite pregnancy book. It's a brilliant reference for healthy vegan pregnancy and for those who are interested in a more natural, holistic birth. Although there is very little about hypnobirthing in this book, all the information within works hand in hand with the principles and is a source I'd recommend to all likeminded mamas. 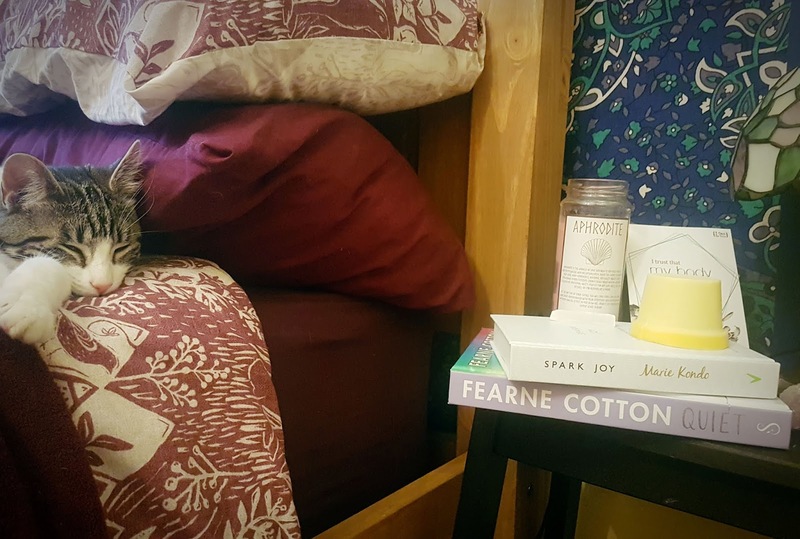 -Quiet by Fearne Cotton feels like it was written for me - it discusses "learning to silence the brain chatter and believing that you're good enough." I've long suffered with a constant mental narrative that is prone to anxious and critical thought patterns - but this is something so ingrained it's easy to become used to, and as a result I've never truly considered how I could stop this cycle. This book has allowed me to look at this thought pattern in a different way and to feel able to override certain feelings for an overall kinder manner of self-talk. -Spark Joy by Marie Kondo - since Tidying Up was released on Netflix in January Marie Kondo has become a buzzword for 2019. I've been a follower of her methods since I read her books several years ago thanks to the wonderful Kimberley, and I can honestly say my house has never been the same since - nor has my attitude towards clutter. For those unaware of the KonMari method, it's a way of decluttering your house that will last - the premise is simple - if something doesn't "spark joy", or if you don't believe it to be useful, it no longer is beneficial to your home so you thank it and let it go. As I'm starting to want to nest it's inspired me to KonMari my house with a fine tooth comb (though in my experience her methods work and last, what sparks joy for you can change and items can lose their usefulness - it's always good to go over things once in a while) and I can't wait to get Shroomie's room organised. Whilst Kondo's first book explains her method in more detail, Spark Joy is the book I find essential as it illustrates the best way to fold items in order to reduce clutter and keep things tidy -and cliche as it is, I personally find that the tidier my house is, the tidier my mind is. Finally, the last thing I wanted to mention were a couple of products I've really loved during this trimester. When it comes to facial skincare, I'm continuing to use the Green People skincare I reviewed previously, which has been really gentle but helpful in dealing with my very changeable skin. I've also absolutely loved using the solid body lotions and massage bars from Lush as they melt beautifully onto the skin and feel like they go that little bit further - I'd recommend Little Pot of Energy for mornings, and Therapy when you have a little more time (or are getting a massage!) I've also found that Dream Cream has been really helpful for chronically itchy skin as it stretches. Finally, if you're really concerned about stretch marks, I'd recommend the Superdrug Restoring Skin Care Oil which is affordable, cruelty free and vegan compared to its competitor! I hope that some of these things might be useful to you - whether you're just needing some self care ideas or are also a mama-to-be in need of some TLC. I'd also love to know your own self care tips and tricks - any recommendations of products, books or rituals are always much appreciated!